An effective, minimalistic diy facemask with scientific backup that takes only one(!) ingredient next to water: Oatmeal (aka Avena Sativa). Preferably finely milled to colloidal oatmeal. Who knew that grandmother’s old house remedy turns out to be so much more effective than most pricey beauty products. I must admit I was a little surprised. There are a lot of things in oatmeal which make it a great face mask. Starch, lipids, proteins, and beta-glucan (a polysaccharide) serve both to keep water inside and on top of your skin. Oatmeal has also been shown to normalize the pH of your skin and protect it a little bit from harmful UV rays (read more here). The best about it? It is very, very low irritating and allergenic sensitizing (see here). Additionally you can find research implying it is a great remedy for atopic dermatitis, psoriasis and drug-induced rash (e.g. 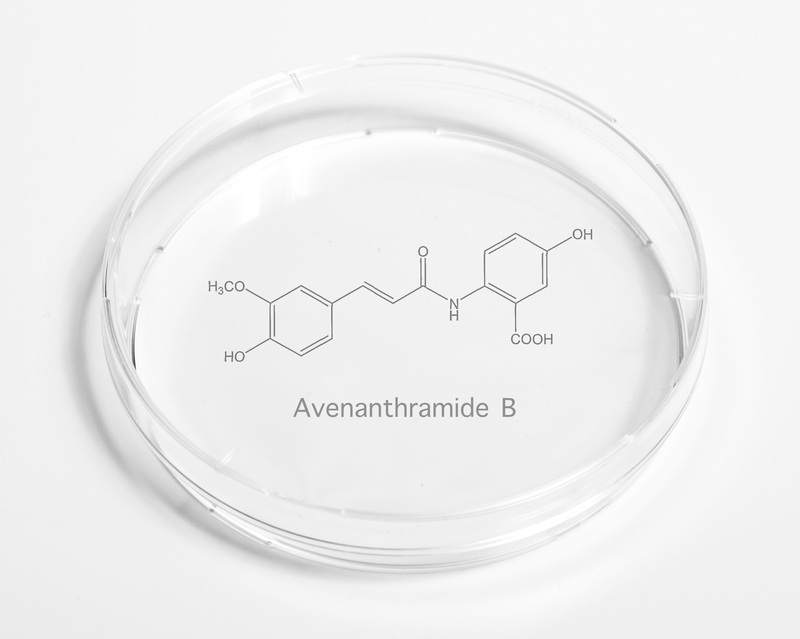 1, 2, 3) mostly because of one attractive component of oats: chemicals called avenanthramides (see picture above for one of them, Avenanthramide B). These only make up 0.03 per cent of dry oatmeal by weight, but are powerful antioxidants, and have strong anti-irritant and anti-inflammatory effects on the skin. Aventhramides seem to act as a soothing agent to relieve itch and irritation (read here and here). I think that is a lot of efficiency for a 20ct-worth face mask compared to the average face care product. Oatmeal is a healthy snack, too! It helps you to curb your appetite and leaves you satiated for a while(see here). Well, I am pretty sure tomorrow i am going to eat my morning porridge with much more enthusiasm. Best, Ea Birkkam.